Sorry for interrupting the fascinating story of how I built my frames, but I'm super excited about this week's garage sale find. And I have a cautionary tale about being 'too careful' (i.e. cheap) with money. A couple weeks ago, I went to visit Roger, a very experienced boat builder in my area. I don't know what he thought of me, since I don't remember doing anything more intelligent than walking around his amazing shop with my mouth open, uttering the word 'Wow' every so often, but I learned a lot from him. Among the other secrets he let me in on was the fact that you could find great old tools at garage sales for less money than you'd spend buying new tools of inferior quality. Now, to be honest, I've been off garage sales since moving to Long Island. I used to love them when I lived in upstate New York and New Hampshire, back before eBay turned junk into 'collectibles'. "Back in the olden days", out in the country, you could find all sorts of stuff at garage sales. Being a bookish kind of guy, I was especially interested in old books, of which the old-time sales had plenty. Anyway, Roger had drawers full of tools that he'd picked up for next to nothing at garage sales, so, my need for tools being great and my dingy fund being sadly depleted, I decided to give garage-saleing a try this past Sunday. I even managed to drag Helena away from her hobby -- redoing our 100 year old cast iron windows. She looks 10 times more handy than I do, so I figured she'd be good to have along, just in case I needed to do some heavy negotiating. Actually, I was pretty skeptical. 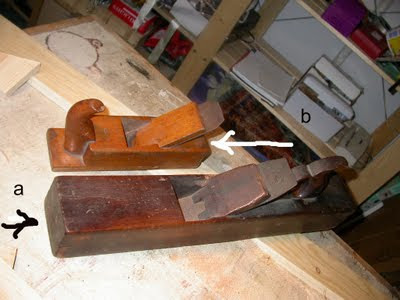 I mean, my most immediate need was for a hand plane to help shape a beautiful block of oak (thank you, Roger!) into something approximating the 'stem' or front of my boat. What was the chance that I'd find something as specific as a plane at a garage sale? The seller said his father used them in World War II when there was a shortage of steel and planes had to be made out of wood, but I wonder if they might be even older than that? The top, light-colored one is a French made plane with the words "PEUGEOT FRERES" on the blade. 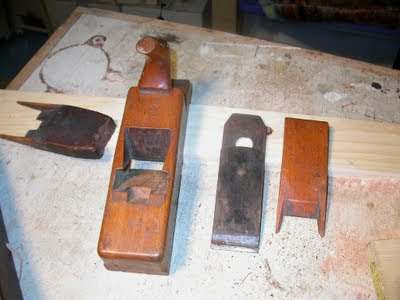 The other is an English plane made by W. Butcher. If you know anything about them, I'd be glad to hear about it. Anyway, I'd never owned a plane, much less a wooden plane, so when I got them home, I had no idea what to do with them. Whoever used them last had retracted the blades so they were not protruding from the bottom. However, some careful thumb-probing indicated that they were still fearsomely sharp. 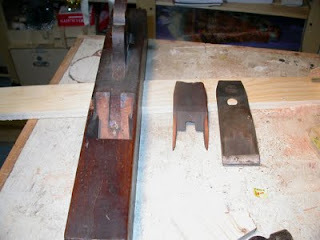 The planes seemed to be of extremely simple construction, consisting of only 3 parts: the body of the plane, the blade, and a wooden wedge that kept the blade in position. Both wedges were still doing their jobs fantastically well, too. First thing I tried to do was to pull the wedges out. I tried wiggling the blades free. They didn't move a millimeter (hey, they are European planes). I decided to post a quick question to the Wooden Boat Forum (fantastic resource, by the way), and within a few minutes, got back several recommendations. When it comes to wooden boats, there always seems to be several ways to skin the cat. The most interesting idea came from Nick in the UK. I guess they still use ancient tools over there. He claimed a few raps on the back of the plane, like at 'B' in the photo below, would back the blade out of the body and loosen up the wedge. I say 'interesting' only because the idea seemed so daft. I mean, these wedges were really, really stuck. How could a few taps on the back possibly free them up? However, one of the things I love about boat building is discovering neat tricks that builders have discovered over the last thousand years or so. The most improbable things do work, and work amazingly well, so I gave the French plane a few smart raps on the back with a hammer, and sure enough, the wedge freed right up. I still can't figure out why it works, but it does, and that's really all that matters. Pretty amazing, eh? Well, I was amazed. The first garage sale we stopped at. What are the chances, I ask you? It must have been Fate. Fate wants me to build a boat. What more can you ask for? And $15 for the pair. I do have one regret, though... there was a third plane, a mate to the French plane. Roughly the same size, but a smaller blade. The guy wanted another few bucks for it. Did I buy it? Sometimes you can be too... cheap. I think I might drive by his house tomorrow, see if he's still got it. Sailors should never spurn Fate. The plane irons and the bodies will have been made by different companies. Put it on a flat surface. Put iron in touching the surface. Put in wedge and firmly press in. Light tap on the wedge and it should take a pretty nice cut. Tap on back lightly to take thinner cut. Tap on top of iron to cut deeper. Butcher irons are really nice. Enjoy. Nice score for the money. It works because of the inertia of the blade. Pounding the body down is like pounding the blade up except you do not have to touch the blade. That make sense, Denny. Thanks!